Found the above graphic Pinterest, I find it interesting that the way the world is set up today people are supposed to always be “on” in order to feel successful. You know, you always got to be on your grind–growing your business, running your household, taking care of those who depend on you, whether that’s children, friends and family, or clients. You are programmed to make it happen. But, how does the “work all the time lifestyle” effect your relationship with God? We were made to work, as you can see in Genesis 2:15, and if we are to follow God’s example we to take time to rest as He did in Genesis 2:1. If you really want to get down to it, if you are putting your hustle above resting, you are robbing God of His time with you, and more serious, your hustle might be an idol in your life. Yikes. When you turn the phone and computer off, stop working–physically and mentally–quiet the voices in your head that tell you to just do one more thing, and let go of stress, confusion, and worry, God’s small still voice can be heard more clearly. 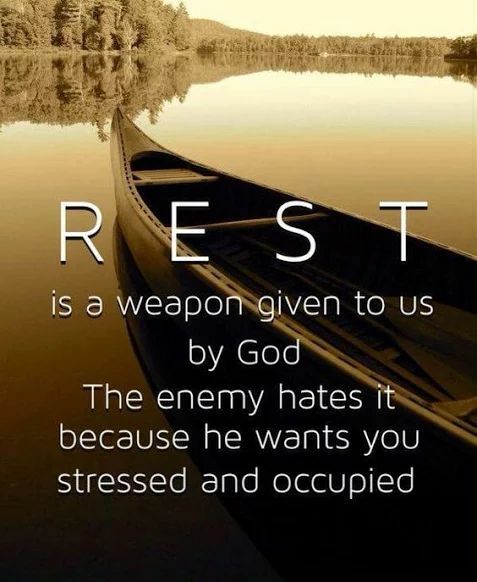 God uses our rest time to get to work. For some of us, it’s the only time God can take control in our lives. Resting allows God to move unobstructed on our behalf. If for whatever reason rest doesn’t come easily to you, give it to Jesus because he said in Matthew 11:28, He’ll give you rest. So many of the things you use and consume throughout the day are designed to keep you busy, but it’s the quiet stillness that strengthens your relationship with the Lord. There is absolutely nothing wrong with being about your hustle, but when you feel it’s time to get some rest–give yourself permission to take some time and rest. God did it and so can you. What do you do for rest and relaxation? Let me know.